This is a hybrid WebGL part task trainer/online learning object. I designed it as an experiment for 3D web development using glTF™ (GL Transmission Format) with its cost-effective specification that is royalty-free. Instructions: Select each identifier pin in order to see its annotated diagnosis. Then press this annotation to open an instructional video on the treatment of each ailment. 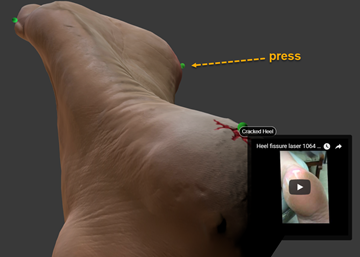 There are six treatments on the 3D scanned foot model I created for display. Try this on your phone to see how amazing interactive WebGL is!